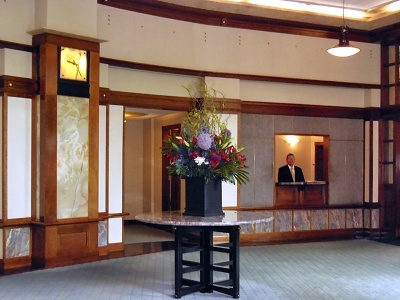 River Court provides 24 /7 Concierge service through the front desk in the main lobby. The Concierge monitor persons entering and exiting the building via security cameras. They also notify residents of the arrival of guests, deliveries, etc. Each resident is given an access card which allows them access to the building, garage and Health Club. The Concierge should not be relied upon to open entry doors by using the computerized security system. River Court asks that you assist the staff in their efforts to maintain security in the building by using your own access card when entering and exiting and instructing your visitors to enter through the main lobby entrance on Rogers Street. Please note that for added security, card access will not work on secondary doors after 10:30PM. Therefore, you must use the main entrance or garage entrance after this time. In order for the Concierge to properly serve you, please provide them with your local phone number to contact you and to announce visitors, etc. Regarding packages and deliveries, the Concierge will notify you of such by placing a notice on your mailbox. The notice will inform you of the type of delivery. To avoid over-crowding the Concierge area, we ask that you retrieve your packages as soon as you are notified.